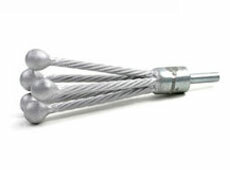 The Patented DEB-3, 3x, 4 and 4x Flare Brushes have a cobalt base hard facing which is flame-coated to the ends of stainless steel aircraft cable. Use with slow RPM drill motor for chipping operation. Suitable for carbon removal from ports, etc. Will cover IDs up to 1 1/2." DEB-4 5-Prong Light Duty. Will flare out at 2,000 RPM for rust and scale removal from pipe IDs. Long life as long as it does not get hung-up, which will twist cables. Will cover IDs up to 5". DEB-3x Similar to DEB-3 except with longer prongs up to 4" IDs. For rust removal from pipe IDs at 2,000 rpm. DEB-4x Similar to DEB-4 except made with longer prongs up to 7" IDs. Note: Available with threaded stem on special request.